Clutch bearings STIEBER – free-wheel clutches.Dagmita is an official supplier of overrunning clutches STIEBER. Overrunning clutches are called so, because they are designed to transfer the torque in one direction. Clutch can’t transfer the motion in opposite direction – it’s rotating in freewheeling. 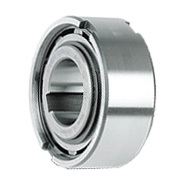 Clutch bearings STIEBER are commonly used in industry (e.g. in transportation mechanisms, in angled conveyor restriction of free motion, when electrical motors are off). • Springs, located in inner ring, load each roller separately. Transformation of the reversing translation motion into the continuous translation motion. Used in material supply, during the production. Connecting and disconnecting dual systems. Blocking of the turning in opposite direction, which may be caused by fault of the rotating element.